Central banks have evolved over many years, and sometimes centuries, as policy-making, not profit-making, institutions, and yet they are structured legally and financially like `for-profit' companies of the twenty-first century. The question is what is an appropriate level of equity, or capital, for a central bank to have so that it can function for policy effectiveness over profit-maximisation, without hindrance to the achievement and maintenance of policy goals? 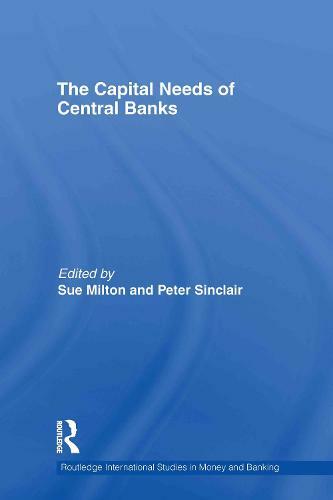 This collection takes the reader through historical, theoretical and factual discussions on why central banks exist and the role - actual and intended - they have in assisting their home nation in achieving monetary and financial stability. The contributions analyse the different ways central banks are funded and how funding arrangements may impact on their independence. The objective is to explore these themes first from the academic and practitioner's views - those of the economist, accountant and lawyer's - and then to introduce practical experiences from a range of different central banks, in terms of their economic and socio-political environments. It will be the first time that the theorist and practitioner, the accountant, the economist and the lawyer come together in one volume. The reader will be able to access the full breadth of views on this important subject. The main observations are that there is no single, quantifiable formula that central banks can use to calculate capital levels. Factors to consider are the historical context of central banks and whether capital was ever appropriate to needs at their foundation; the cultural, social and political contexts; and, in terms of the presentation of financial statements, profit and loss sharing arrangements and what accounting conventions are being used. If these are considered alongside the, often idiosyncratic, mandates individual central banks have, a qualitative understanding of what is an appropriate level of capital is achieved. This collection will be of interest to postgraduates and researchers focusing on the role of central banks in monetary economics; as well as a professional audience of central bankers, the BIS, the IMF, World Bank, EBRD and government departments.